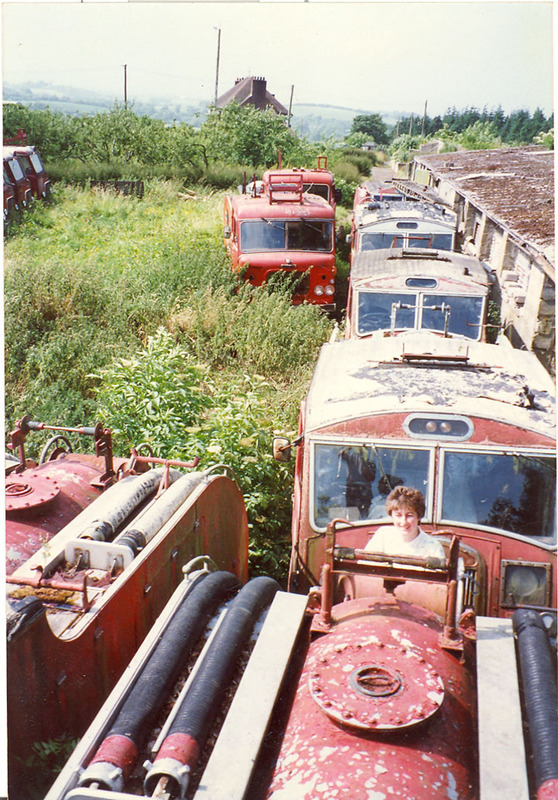 Whilst on the subject of abandoned Dennis's in Northern Ireland, here is a picture of part of the fabled McBurney scrapyard in the early 1990's. There is a field full of F8 Dennis Ulsters slowly decaying along with some more modern Dennis's. Can any of our Northern Ireland friends say whether any of this is still here. as soon as anybody knows i wll let you know could do with getting across there a bit smart!! Added by Jason on 26 January 2007. Would they be AEC's to the left of the picture? Added by Andrew Wright on 26 January 2007. Andrew, I think there were Dennis F26's. We took lots more pictures here, I will post some of the more interesting ones. Added by Barry on 26 January 2007. Added by Pavel Zaremba on 27 January 2007. Barry, this photo is magnificent! !I wish that I was there. Added by Fire995 on 27 January 2007. Added by Martin Thompson on 27 January 2007. Added by Stu0344 on 28 January 2007. If you are thinking of coming this way give me a shout before hand and I can point you to some more appliances and make the trip worth while. Added by Martin Thompson on 28 January 2007. I'd love to buy a dennis F8 for the new fire fighting museum that we are trying to set up in Malta. Does anybody know where I can get one. An F8 used to serve with the Malta Fire Brigade years ago but was sadly scrapped. Added by George Said (Malta GC) on 30 January 2007. George, F8's come up for sale in the U.K. for around £2000 - £5000 depending on the condition that they are in and the amount of equipment that they come with. I have even seen one on ebay. This was the Jersey F8 which was unusual as it carried an escape. However it needed a lot of work doing to it. Added by Barry on 31 January 2007. Thanks Barry - over the next few days I'll try and post a picture of an F8 which skidded and very nearly went over a cliff in Malta. I just need to scan it and upload it. Added by George Said (Malta GC) on 31 January 2007.
hi my name is david talbot and i was wondering where this graveyard is, can any on please tell me? can you visit the yard and are the fire engines still there now? Added by David Talbot on 07 February 2007.
i have made contact with the owner of the yard there are a few left if you are interested in any let me know i will contact him i also have the need of a drivers side door from one of the f28's and some other odds and ends like i say if you let me know when you want to go we could maybe liase ??? Added by Jason on 07 February 2007. Added by Norman Wood on 30 September 2007. Added by Desy Moynes on 09 October 2007. Added by Pavel, Western Australia on 10 October 2007. Added by Jason on 10 October 2007. Added by Geoff Talbot on 12 October 2007. I know a group who have X Northern Ireland Fire Brigade appliances, I will also go to the main Mc Burney yard this week and see what is still there.The Dennis Fire engines in the photo's on this site were taken in fields at Mc Burneys family home and not their main yard. The family home was ironically destroyed by fire sum years past, "it's a funny old world"
Added by Desy Moynes on 14 October 2007. The main yard is an aladdins cave of old lorries ect. They once had all the old Army Scout cars, but sadly there's none of these left. They still have some of the static pumps. Let us know how you get on, my son is very interested, he is in the Fire Cadets based in Lisburn. Added by Geoff talbot on 16 October 2007. Shame to see these old girls crushed guys. I live in South Wales UK and we have a fire engine restoration society calleds w.a.f.e.r.s. (Wales area fire engine restoration society) Take a look at the site, got a beautiful fully restored F8 there. Added by Steve on 03 May 2008. I noticed they even didin't (or forget) to took the usable part like the hard suction hose at the deck. It seem like still can be used till now. Anywhere, I hope the owner of this graveyard will maintain the graveyard by cutting the grass so this will prevent those Dennis from getting spoiled by the vegetation. Added by Bomba Boy on 29 June 2008. I pass this yard regularly and remember the engines being parked up around 1977/78, they were clearly viable from the main road between Portadown and Armagh, just outside Armagh at Lindsay Burneys private house in the disused old farmyard attached to the main house and was completely covered with these engines. I wish I realised how hard they would be to find now as I have been on the look out for one for some time now with no success. Added by Ian Balmer on 19 September 2009. Added by Craig Watkinson on 07 July 2011. The yard still exists and the sheds you can see in the picture are still there but there is nothing of the fire engines left. Added by Ian Balmer on 22 July 2011. Did anyone compile a fully detailed list of what was actually here? You know, registrations fleetnumbers etc, and also the dates of when they arrived here? Added by Chris Hall on 22 July 2011. The girl in the picture did! See picture #2038, with notebook in hand. Added by Barry on 22 July 2011. Craig, you may want to look at picture #7275.picture #7279, picture#7282 and picture #7283 which show some of these appliances in 2008. Added by Chris Wood on 26 July 2011.